You may be presented with an account that has to be moved to collections. This is easily done with your Insight account. First search for the account that you need to move to collections. Once inside the account, click on the red move to collections button. Next, you will enter the collection fee and the reason for the account moving to collections. Then, click the red move to collections button. Now you will see that a message has popped up on your member’s account reminding you to complete the collections paperwork. Click on the red complete task button. A form will appear that you will need to complete. 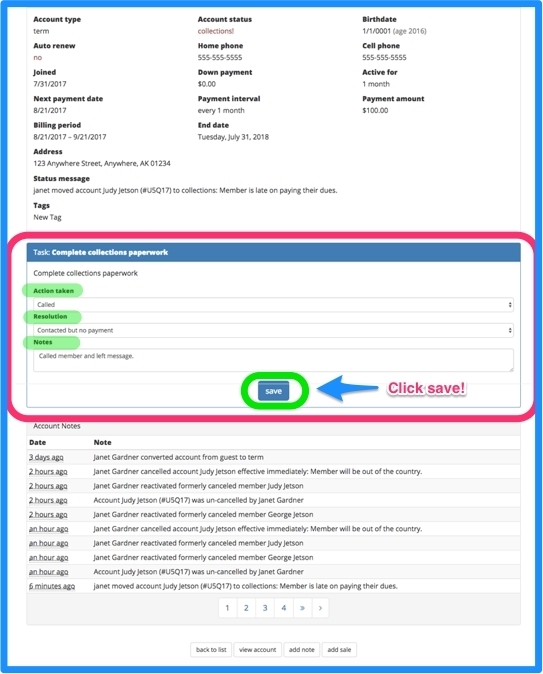 You will see the member’s account information and notes on the account, but the area you will completing is the collections paperwork area in the middle. Here you will enter the action taken such as email, phone call, or spoke to the member in person. You will also enter the resolution as to what happened when you contacted the member. There is also an area to enter a note regarding the action taken. Once you’ve entered all the necessary information, click save. When you are ready to take the account out of collections, just click the green update to green button on the member’s account. That’s it! The member’s account is now out of collections.